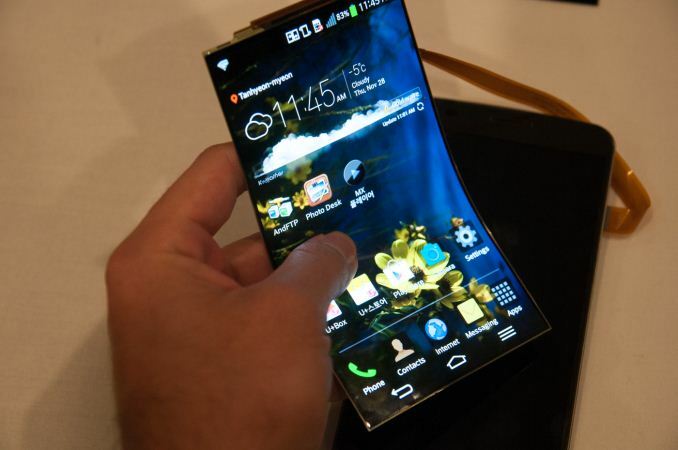 Today we had a chance to get hands on with LG's very hyped flexible, curved smartphone, the aptly named LG G Flex. 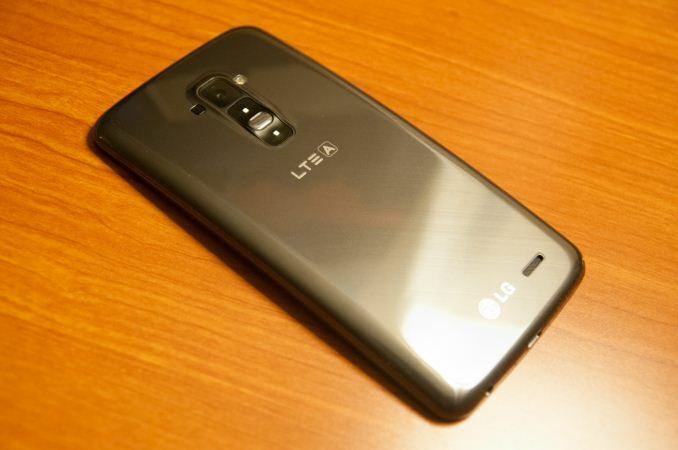 We're going to be reviewing it and giving it the full rundown in due time, but other than its flexible nature, it's a close cousin of the LG G2, with the same Snapdragon 800 SoC at 2.26 GHz, 2 GB of RAM, back mounted buttons, and overall hardware platform. The highlight feature of the G Flex is its 6-inch diagonal 720p P-OLED (Plastic substrate OLED) display with an RGB stripe subpixel matrix. In the G Flex, the display is curved to a 700mm radius of curvature along the horzontal axis. The panel is then bonded to the cover glass which is thin enough to permit flexing while still affording protection – the entire phone can be pressed flat. LG's panel isn't in-cell touch, so there's also a digitizer layer between the two. 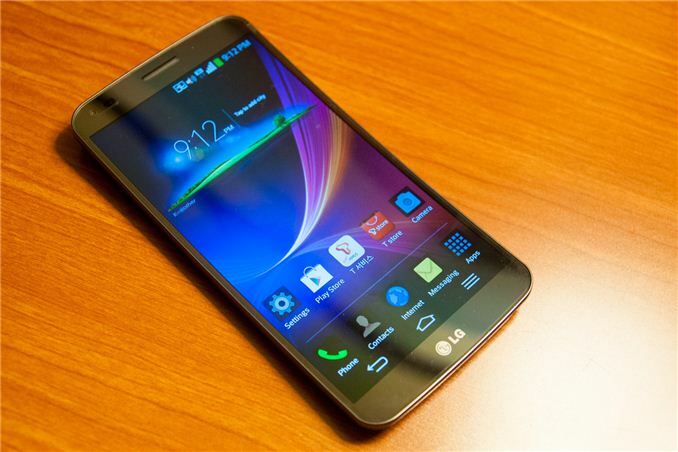 This is LG's first real time using its own OLED display in a smartphone. The display is flexible thanks to its plastic substrate and remains functional as it's deformed along whatever axis. LG had one of the panels standalone but connected to a nearby G Flex, and allowed us to poke, prod, flex, and deform it however we chose. I'm told that the panel can tolerate a radius of curvature down to 400 mm and indeed bent it quite a bit myself. The 700 mm radius was chosen for G Flex since LG felt it was most comfortable. There's still a flat mainboard in the top region of the device, and of course the 13 MP camera module (which doesn't include OIS). Nevertheless the whole device maintains that curved profile and can flex between curved and flat without being damaged if pressure is applied. 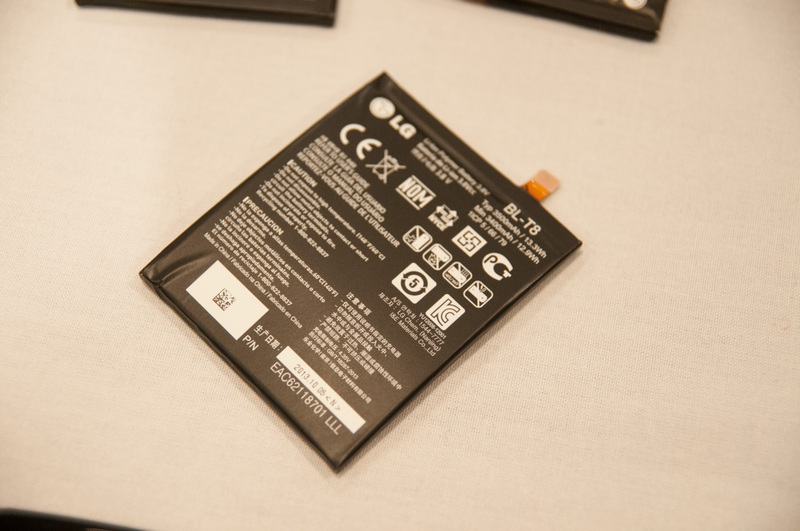 LG also made a curved battery for the G Flex with unique stacked structure inside to reduce strain that would make a traditional battery cell dangerous when bent. It's also gigantic, at 3500 mAh (3.8V) working out to 13.3 watt-hours. I'm told the G Flex lasts noticeably longer than the G2 which already is an incredibly long lasting device. Last but not least the back side of the G Flex is coated with a material that is capable of self repairing small hairline scratches (sleeks) and other marks that you'd be more prone to getting with a curved device. Since the G Flex doesn't naturally lay flat on a surface, LG felt it was the ideal platform to include such a coating. It won't heal dramatic dents or deformations from being dropped, but should keep the glossy-backed device relatively immune to the kind of hairline scrapes that mobile devices quickly pick up when carried without a case. The G Flex is on sale in Korea and will make it to more Asian markets this week, starting with Singapore and Hong Kong. There's no word on any US-specific plans quite yet, but LG hopes it will come soon and notes that discussions are ongoing. Thanks for the update! I'm really interested in full in-depth review. Please don't forget to mention all the problems you've met doing this review and the issues that lead to this delays! I guess Google has something to do with! Personally, I have 3 different android devices, two of them with KitKat and one with Android 4.3 - all of them, after "Google Search" update tend to drain battery, entirely due to the new "Location" mode setting "Battery saving", which basically can be renamed to "Battery drainer". The only viable mode is "Device only". The main benefit here is the screen is essentially a lot less breakable.